Bakersfield, California – Adam Sorokin is the 2019 Bakersfield March Meet Nostalgia Top Fuel Champion. Sorokin drove the Champion Speed Shop small block Chevrolet-powered AA/Fuel dragster to victory with a 5.84 ET at 212 MPH as runner up Mendy Fry watched from the starting line with a broken throttle linkage in the High Speed Motorsports fueler. Sorokin’s second March Meet win with the Champion Speed Shop closed out a weekend of fierce competition at the historic drag racing event. The 61st Good Vibrations Motorsports March Meet saw record runs and unexpected turns on the quarter-mile as the Nostalgia Top Fuel field squared off at Auto Club Famoso Raceway. Rick White emerged as #1 Qualifier with a 5.72 ET at 254 MPH after three frenetic sessions. 2018 March Meet winner Pete Wittenberg failed to qualify after three aborted runs and reigning Champion Mendy Fry drove through a blower explosion and damaging tire shake that had the High-Speed Motorsports team in the pits until 3 AM. Rick White opened Eliminations with a 6.09 ET at 175 MPH win on a single after Phil Ruskowski kept rolling in the “Xibitionist” after zinging the rpm’s and banging the blower on the burnout. Bret Williamson turned a 5.80 ET at 240 MPH in the Mike Fuller “Forever Young” that shut down Brendan Murry in the “Running Wild”. Mendy Fry blasted to a quickest and fastest ever 5.51 ET at 265 MPH win over Jim Murphy in the WW2. Adam Sorokin advanced with a 5.98 ET at 201 MPH as Rick McGee clipped some cones in the Tedford & McGee “Overtime Special”. Sorokin drove the Champion Speed Shop small block Chevrolet into the Final with a 5.83 ET 212 MPH win as Rick White struck the tires in the Neal & White AA/Fueler. Mendy Fry then broke her own Nostalgia Top Fuel record with a 5.49 ET 259 MPH Semi-Final blast over Bret Williamson’s 5.85 ET at 234 MPH. Side by side burnouts set up the Final round battle at Famoso and Sorokin etched his second March Meet win into the Top Fuel timeline behind the canopy of the Champion Speed Shop dragster. Head over to Auto Club Famoso Raceway for a complete rundown of official results and archived video coverage of the entire 61st Good Vibrations Motorsports March Meet. Bakersfield, California – Top Fuel titans of the All-American Fuel Dragster coalition are loaded up with nitromethane and headed to the 61st Good Vibrations Motorsports March Meet at Auto Club Famoso Raceway March 7th-10th. The historic event is the NHRA Hot Rod Heritage Racing Series season opener and first shot at the championship for the front-engine nostalgia Top Fuel ranks. Season champion Mendy Fry is back in the “High Speed Motorsports” dragster and last year’s March Meet winner Pete Wittenberg will stage in the “KMA Circuit Breaker.” Adam Sorokin will drop the lid on the small block Chevrolet-powered “Champion Speed Shop” dragster and Brendan Murry will light up his “Running Wild” 426 hemi. Bret Williamson will pilot the Mike Fuller “Forever Young” fueler and two-time March Meet champ Rick McGee will turn hours into seconds in the Tedford & McGee “Overtime Special”. Four-time March Meet winner Jim Murphy will gun for a record 5th victory in his “WW2” dragster and driver Phil Ruskowski, the Island Nitro Gang and their small block Chevrolet “Xibitionist” digger are heading south from the Great White North. Land-speed luminary and 2011 March meet winner Rick White is strapping into the Neal & White “Autopower” AA/Fuel dragster at the ‘patch. All-American Fuel Dragsters President Bob McLennan is proud to announce that the Top Fuel Internship program will return for its second year. The team effort between the Jim McLennan Foundation, Bakersfield College, Auto Club Famoso Raceway, and AAFD racers places select automotive students on Top Fuel crews for a real-world introduction to drag racing and course credit. The March Meet Top Fuel battle starts with nitro-fueled testing on Thursday at 3 PM. Qualifying kicks off at 12 PM on Friday. Eliminations are currently scheduled for Sunday. Head over to the Auto Club Famoso Raceway for the latest March Meet information. Schedule subject to change! The 61st Good Vibrations Motorsports March Meet is the first of six races in the NHRA Heritage Series Nostalgia Top Fuel championship season that concludes with the NHRA Motorsports Museum California Hot Rod Reunion in October 25th-27th at Auto Club Famoso Raceway. Points count across all six races with the addition of the Nitro Summer Nationals at Spokane County Raceway August 16th-17th. Las Vegas, Nevada – The All-American Fuel Dragsters coalition has dispatched a quartet of 260-mph front-engine Nostalgia Top Fuel ambassadors to the NHRA Toyota Nationals at Las Vegas Motor Speedway October 25th-28th. Four teams spanning three generations of AA/Fuel drag racing are slated to run three special exhibition sessions and bring the fans a taste of Top Fuel, NHRA Hot Rod Heritage Series-style. At Vegas, Adam Sorokin will drive the Champion Speed Shop small-block Chevrolet powered AA/Fuel dragster, Bret Williamson will strap into the Mike Fuller Motorsports Forever Young Hemi, and young Tyler Hilton — backed by his father Robert Hilton and grandmother Alison Lee — will pilot the big-block Chevrolet powered Great Expectations III machine. California Hot Rod Reunion winner and 2018 NHRA Heritage Series Nostalgia Top Fuel champion Mendy Fry will drive the Tom Shelar-tuned High Speed Motorsports Hemi-powered juggernaut. To the uninitiated, what makes this class unique is not just the bravado of the drivers sitting behind 3500-horsepower blown-on-nitro motors during fierce, spectacular competition (as showcased at NHRA Hot Rod Reunions), but also its connection to NHRA’s heritage. 2nd-generation driver Adam Sorokin’s father Mike Sorokin was the “shoe” of the legendary “Surfers” Top Fuel car in the 1960s. Williamson’s father Don Williamson was a first-wave Funny Car racer with his “Hairy Canary” Valiant. Mendy grew up in her dad Ron Fry’s NorCal-based chassis shop, and Jim & Allison Lee’s campaigned their first “Great Expectations” AA/Fuel Dragster in 1965. Nostalgia Top Fuel is currently scheduled to run following Friday’s 12:30 PM Funny Car and Top Fuel Q-1 session, Saturday’s 12:30 PM Top Fuel and Funny Car Q-2 session, and preceding the Parade of Champions and Finals on Sunday. As always, the schedule subject to change. Tune into the NHRA Toyota Nationals on FOX or NHRA All Access for Mello Yello Racing Series competition and the unique appearance of Nostalgia Top Fuel from the NHRA Hot Rod Heritage Series. BAKERSFIELD, California – Mendy Fry drove into the 27th California Hot Rod Reunion with the 2018 NHRA Hot Rod Heritage Series Top Fuel championship already in hand and drove the High-Speed Motorsports AA/Fuel Dragster over the finish line for the event win. Her Top Fuel victory at Famoso Raceway in Bakersfield marked a three-peat season clincher for Fry and the team after successive wins the National Hot Rod Reunion and Nightfire Nationals. “We lost only one round of racing this year, ran the table on Low ET and Top Speed at every event except for Top Speed at the National Hot Rod Reunion. I’d say Tom Shelar and the crew have it dialed in. My team gave me the car to beat, and I didn’t screw it up. So this win is theirs. I’m just glad they picked me.” said Mendy. Fry drove the High-Speed Motorsports dragster to number one position in explosive qualifying rounds and set event Low ET and Top Speed with a 5.55-second, 261 MPH Semi-Final win. Fry took the event win with a hard-charging 5.61 ET at 259 MPH over Rick McGee, who launched the Overtime Special to a 5.74 ET at 256 MPH for Runner Up. The final round was a dramatic conclusion to the 2018 Hot Rod Heritage season following a frenetic weekend of Top Fuel qualifying and racing action at the California Hot Rod Reunion. Through three Top Fuel qualifying sessions, some drivers saw newfound success and others met surprising disappointment as teams pushed to run the numbers while chasing Fry and the remarkably consistent High-Speed Motorsports entry. Dan Horan Jr. blasted out of the gate with a 5.87 ET at 253 MPH but hurt the Fritz Kaiser-tuned late-model Hemi in the Second Session. Irreparable damage to Horan’s mount brought Tyler Hilton and the Great Expectations III back into the show from the bump with his 5.90 ET and 255 MPH qualifying Top Speed. The qualifying shocker was 2017 Heritage Series Champion and Event Honoree Jim Murphy, who was unable to get the WW2 entry into the show. After missing the tune-up twice, Adam Sorokin lit the candles down the entire quarter-mile and blasted the Champion Speed small-block Chevrolet fueler into the running with a 5.72 at 243 MPH in Session Three. Dusty Green pedaled Steve Harwood’s Nitro Hemi to no avail after an extended Session Three cleanup and considerable track temperature drop. 2017 California Hot Rod Reunion Top Fuel winner Jim Young drove the Young Guns into the number two qualifier spot. Round One Eliminations opened with Rick McGee pedaling his way into the Semi-Final with a 6.07 ET at 222 MPH after Jim Young red lit in the Young Guns dragster. Mendy Fry belted out a 5.58-second 258 MPH win over Tyler Hilton who extracted a 6.30 ET at 251 MPH out of the big-block Chevrolet. Pete Wittenberg moved on with a 5.73 ET at 244 MPH on a single after Rick White and Chuck Neal could not get their dragster out of reverse after the backup. Adam Sorokin took the win with an explosive 5.88 ET at 213 MPH after Bret Williamson got loose and the Forever Young went up in smoke. Number seven qualifier Rick McGee launched the Overtime Special into the final with a 5.74 ET at 233 MPH over Adam Sorokin who ran side-by-side up to the 1000-foot mark for a 6.00 ET at 182 MPH. In a March Meet final round rematch with an alternate outcome, Mendy Fry pushed the High-Speed Motorsports fueler to event low ET with a 5.55-second, 261-MPH run as Pete Wittenberg clipped a cone for a DQ and 6.15 ET at 169-MPH. Rick McGee grabbed the green in the final with a .036 reaction time in the Overtime Special but Fry charged hard past the 300-ft mark for the 5.61 ET at 259 MPH victory over McGee, who lit up the clocks with a 5.74 ET at 256 MPH for Runner-Up, closing out the 2018 season until the 2019 Bakersfield March Meet. A baker’s dozen’s worth of AA/Fuel Dragster combatants will close out the 2018 NHRA Hot Rod Heritage Series this weekend with a supercharged 8-car Top Fuel Eliminator at the 27th California Hot Rod Reunion at Auto Club Famoso Raceway in Bakersfield, California. Thirteen drivers representing three generations of nitromethane-fueled drag racing are ready for the final race of competition. With an incontestable points advantage following consecutive event wins at the NHRA National Hot Rod Reunion and Nightfire Nationals, second-generation drag racer Mendy Fry and the “High-Speed Motorsports” team are already the 2018 Nostalgia Top Fuel Champions. But for the rest of the field, it’s not over until its over and the battle for the event win and number two Nostalgia Top Fuel points position will certainly be fierce at Famoso. Current 2nd place points sitter and March Meet Winner Pete Wittenberg is back in the saddle of his early-model Hemi-powered “KMA Circuit Breaker” after a semi-final finish at the Nightfire Nationals in Boise. Venerable Brendan Murry is heading out of the Murry Building in San Jose, California with the “Running Wild” late-model Hemi-propelled dragster in tow. 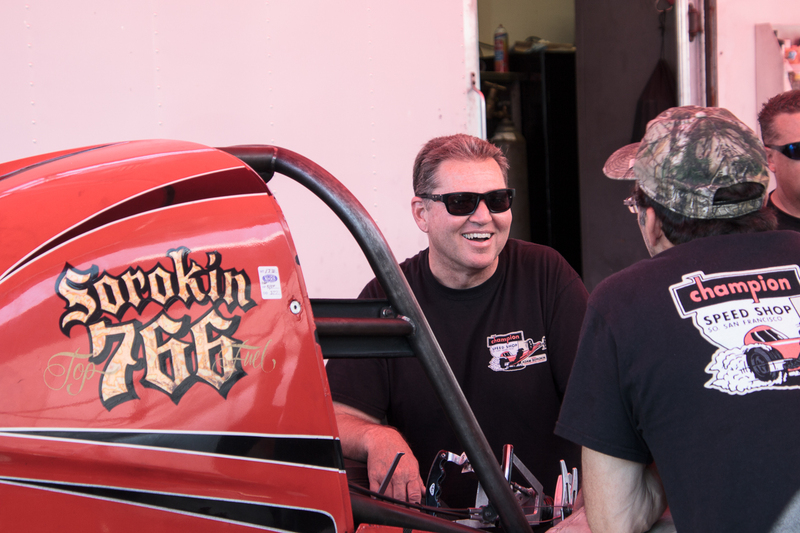 Second generation dragster driver Adam Sorokin is confident that the “Champion Speed Shop” small-block Chevrolet combination can make more with less at Bakersfield. “We’re concentrating more on making the car run harder and longer. We will be just staying on our side of the tree and maximizing everything we can,” said Sorokin. After a Herculean runner-up finish at Boise, Dusty Green will once again team up with Steve Harwood’s “Nitro-Hemi” contender. Bret Williamson will strap into Mike Fuller’s “Forever Young” AA/Fuel entry. 2006 CHRR Top Fuel winner Jim Murphy will drive the “WW2” fueler as an event Honoree. Last year’s Reunion winner Jim Young is hauling his Hemi-powered “Young Guns” rail to Bakersfield from Wisconsin and third-generation drag racer Tyler Hilton is moving towards California after posting the quickest and fastest time yet in the big-block Chevrolet-powered “Great Expectations III” AA/Fuel Dragster at the Nightfire Nationals in Boise, Idaho with a blistering 5.88 ET at 249 MPH. Rick White is suiting up in the “Neal & White” front-engine dragster, and Dan Horan Jr. will push his departed father “Digger Dan” Horan’s front engine dragster towards the high fives with a tuneup from 1995 March Meet winner Fritz Kaiser. Phil Ruskowski and the Island Nitro Gang are motoring to Famoso from Canada with their small-block Chevrolet-powered “Xhibitionist” digger. Veteran driver Rick McGee and crew have been putting in plenty of extra hours preparing their Hemi-powered “Overtime Special” dragster for battle at the ‘patch. And in a gesture to ensure future participation in the sport, the Jim McLennan Drag Racing Foundation is once again firing up its successful Top Fuel Intern program, taking students from Bakersfield College and tasking them with mechanical maintenance on these exotic front-engine Top Fuel dragsters. Solidifying the Reunion’s relationship to the past and present, former Top Fuel Champion, stunt driver Kelly Brown will serve as the Reunion’s Grand Marshal. Event Honorees include crew-chief extraordinaire Bob Brandt, A/Fuel driver and trainer Jerry Darien, onetime Hot Rod Magazine Editor and current drag racing journalist-historian Dave Wallace Jr., former Car Craft Magazine Editor and drag racer Rick Voegelin, and 2017 NHRA Hot Rod Heritage Series Nostalgia Top Fuel Champion Jim Murphy. The All American Fuel Dragsters will join nitro-huffing Funny Cars, awful AA/Fuel Altereds, front-engine blown alcohol and injected nitro A/Fuel dragsters, and the Wally Parks NHRA Motorsports Museum curated collection of nitro-burning history in is annual “Cacklefest.” Historic push-starts are scheduled to occur throughout the weekend. Hundreds of Hot Rods and Customs will complement a swap meet full of vintage speed parts along with specialty equipment and memorabilia vendors on the midway. To purchase California Hot Rod Reunion tickets call 1-800-884-NHRA, head over to NHRA or drive on out to Auto Club Famoso Raceway. Nostalgia Top Fuel Championship points standings heading into the 27th California Hot Rod Reunion at Auto Club Famoso Raceway, the 4th and last race in the 2018 NHRA Hot Rod Heritage Series following the cancellation of the Nitro Nationals at Tulsa Raceway Park. Driving through violent tire-shake, Mendy Fry took the 47th Pepsi Nightfire Nationals Top Fuel victory, Low ET and Top Speed with a 5.66 ET at 254 MPH blast in her “High Speed Motorsports” AA/Fuel dragster at Firebird Raceway in Boise, Idaho. “It was pretty bad — I didn’t think I was going to make it. The team gave me a great car, and I didn’t screw up,” said Mendy. Runner-up Dusty Green pushed Steve Harwood’s “Nitro-Hemi” to a 6.04 ET at 198 MPH in the final after his holeshot-assisted 2nd-round battle with Pete Wittenberg was settled by few thousandths of a second margin of victory. “It was a great weekend for the Nitro-Hemi team. We had a good run against Pete and just didn’t have enough for the High Speed Motorsports team”, said Dusty. As examples of the class’s camaraderie, Bowling Green runner-up Jim Young texted tuning advice to semi-finalists Wittenberg and vanquished foes from the “KMA Circuit Breaker” and Brendan Murry’s “Running Wild” teams gathered to help Dusty Green and the Nitro-Hemi crew prepare for the final round. “That is what this sport is about. Awesome people. I can’t thank them enough”, said Dusty. Session One Qualifying kicked off Friday afternoon with nine AA/Fuel dragsters battling for nitro supremacy in 100-plus degree temperatures. Mendy Fry struck the tires on the 150-degree track Friday but motored to the top of the ladder Saturday afternoon with a 5.68 ET. Adam Sorokin landed the number two slot with a 5.85 ET in the Chevy-powered “Champion Speed Shop” entry. Dusty Green pushed the Nitro-Hemi to number three with a 5.97 ET at 243 MPH. Tyler Hilton stepped up with his family’s “Great Expectations III” to the number four position with a 6.07 ET, landing ahead of number five Bret Williamson’s and the “Forever Young” fueler’s 6.09 ET. Brendan Murry drove the Running Wild to number six with a 6.18 ET and Pete Wittenberg came back after breaking a drive belt in Session One to qualified seventh with a 6.22. Jim Murphy landed the “WW2” fueler in the number eight slot with a 6.58 and Canadian Phil Ruskowski was 1st Alternate following a herculean effort to get to the Nightfire Nationals after an engine explosion at a previous race. 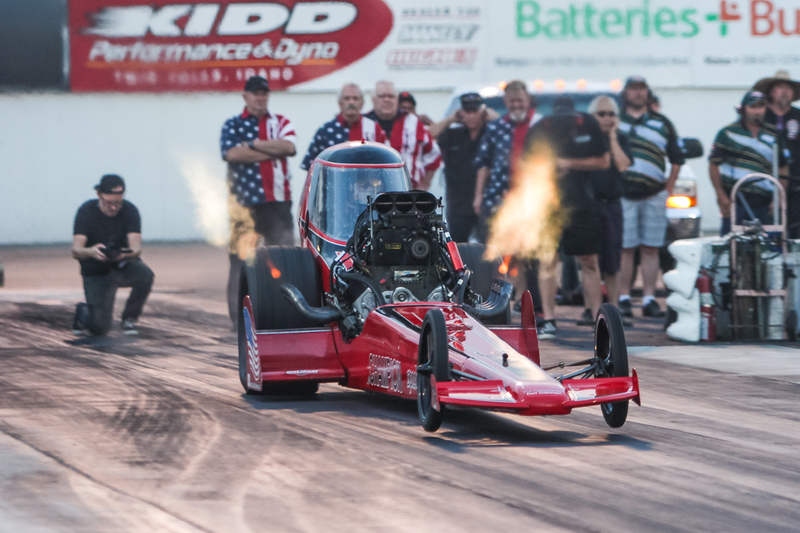 The Nightfire Nationals is famous for header flames under the lights and Saturday night’s Round One Eliminations saw Mendy Fry run a 5.67 ET at 253 MPH for the win over Jim Murphy’s 6.48 ET at 158 MPH. Pete Wittenberg turned on the KMA Circuit Breaker for a 5.73 ET at 253 MPH win on Adam Sorokin, who pushed the small block Chevrolet to 5.90 ET at 244 MPH. Dusty Green extracted a 5.98 ET at 248 MPH from the Nitro-Hemi ahead of Brendan Murry, who ran an 8.62 ET in the Running Wild. Tyler Hilton blasted the Great Expectations III to a 6.03 ET at 243 MPH over Brett Williamson’s 6.11 ET at 221 MPH, setting the stage for the Semi-Final battle on Sunday. Semi-Final Top Fuel competition was tight and fierce. Pete Wittenberg ran a 5.71 ET at 252 MPH with a .145 reaction time and yet didn’t catch Dusty Green’s 5.80 ET at 241 MPH with an .054 reaction time. The margin of victory? 6/1000ths of a second and a few inches Inches at the stripe. Mendy Fry posted a 5.69 ET at 231 MPH to beat Tyler Hilton’s 5.88 ET at 249 MPH — the quickest and fastest run ever for the Great Expectations III big-block Chevrolet-powered AA/Fuel dragster. Tyler, his dad Robert, grandmother Alison Lee and crew divined the formula for success with a blend of timing and clutch fine-tuning and ran the weekend with minimal engine carnage. The combined forces united at the Nitro-Hemi pit thrashed through an engine teardown for a shot at victory in a Hemi vs. Hemi Nightfire Nationals Top Fuel decider. At the green light, Dusty Green got out of the gate with .112 reaction time, but in the end it wasn’t enough against Mendy Fry who kept her foot down and muscled through tire shake for the win. After striking the tires in Session One qualifying, Mendy Fry drove the High Speed Motorsports AA/Fuel dragster with remarkable consistency through qualifying and eliminations with 5.66, 5.67, 5.69 and 5.66 runs for event Low ET and 254 MPH Top Speed. Mendy Fry’s victory at the 47th Pepsi Nightfire Nightfire Nationals at Firebird Raceway earned her the number one position in the NHRA Hot Rod Heritage Series Top Fuel Championship points battle heading into the fourth race of the five-race 2018 season at the Nitro Nationals at Tulsa Raceway Park September 21st and 22nd. All photos Arlene Eliason and AAFD. 47th PEPSI NIGHTFIRE NATIONALS TOP FUEL PHOTO EXTRA! 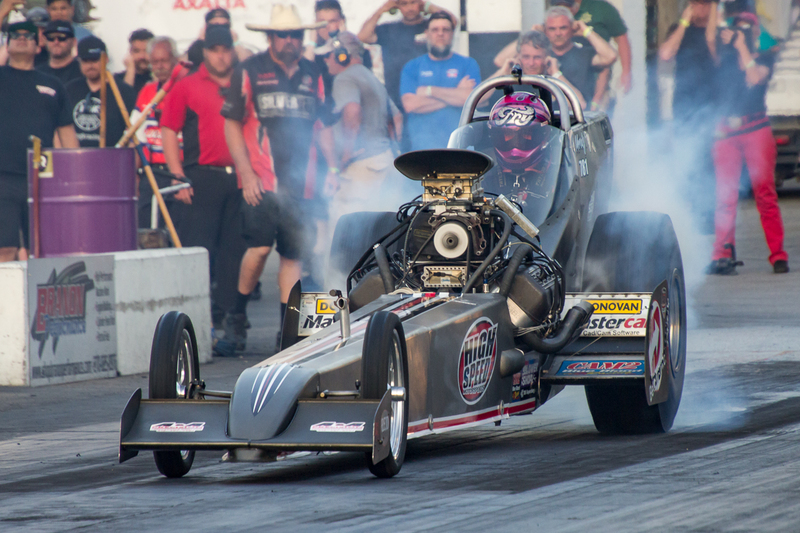 Current series points leader Mendy Fry is gunning to hold onto the lead after her victory at the National Hot Rod Reunion at Bowling Green, Kentucky in the High-Speed Motorsports AA/Fuel Dragster. Brendan Murry is heading out from San Jose, California in the number two position after an outstanding performance in the Running Wild dragster at Bowling Green. Nightfire Nationals defending champion Jim Murphy has made a few changes to his WW2 dragster and is driving towards a repeat Nightfire Nationals win from the number eight points position after stepping out of Bowling Green to help rebuild the fire-ravaged Sonoma County California region he calls home. Seventh place points holder Bret Williamson will strap into the hemi-powered Mike Fuller Forever Young AA/Fuel Dragster and California-based racer Dusty Green will once again meet up with the Nitro-Hemi from Colorado with eyes on climbing up out of a rain-soaked March Meet and unlucky National Hot Rod Reunion at Bowling Green. “So far we have had a rough season and we are hoping to turn it around in Boise. We usually run respectably there and would love to turn this season around”. Tyler Hilton and his dad Robert Hilton have sorted out some changes on their Great Expectations III AA/Fueler and are hoping to step up at Boise and keep their fearsome big block Chevrolet from overpowering the tires. “We tried some different stuff since Bowling Green but we are going back to where we were and are pretty confident”. Last and certainly not least are Phil Ruskowski and the Island Nitro Gang who are making a herculean effort to put their Xibitionist Nostalgia Top Fueler back together and get out to Boise after an explosion at Lucas Oil Canadian National races took out the small block Chevrolet in a supercharged fireball. Thanks to tremendous support from the team and spouses along with sponsors and friends signs are better than good that Phil and the Island Nitro Gang are going to make the 47th Pepsi Nitro Nationals an international Top Fuel competition. “Getting to Boise is taking all my thoughts and time. Right now when I go to bed I don’t dream of sandy beaches I dream of BOISE and we can’t wait to see you all there! Small blocks on Nitro Forever”, said Phil on his Island Nitro Facebook Group. Nightfire Nationals AA/Fuel Dragster, AA/Fuel Altered, and AA/Funny Car nitro qualifying and eliminations run from Friday, August 10th through Sunday, August 12th. The 47th Pepsi Nightfire Nationals kicks off on Thursday, August 9th with Sportsman racing at 12:30 PM. Run schedule is subject to change. NHRA Hot Rod Heritage Series Nostalgia Top Fuel Championship points standings ahead of the 47th Pepsi Nightfire Nationals at Firebird Raceway. The 47th Pepsi Nightfire Nationals at Firebird Raceway is the third battle for the 2018 NHRA Hot Rod Heritage Series Nostalgia Top Fuel Championship. Head on over to www.nhrahotrodheritage.com for an upcoming race schedule, news, points, results, rules and more.